Your Window to Shopping is in your Pocket!! Get your online shopping a whole lot easier with the official ShopClues Windows App. 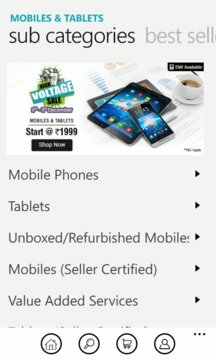 Browse your favorite products from the widest categories of mobiles, laptops, fashion, TV and lot more. 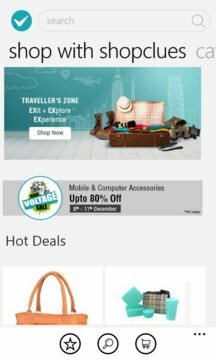 Download the App for FREE and enjoy instant alerts on best deals, big discounts and exciting offers. * Hottest deals and Offers: Get access to personalized and exclusive app-only deals. * Easy Search: Browse or Search products by categories and brands. * Products Wishlist: Add products to your Favorites list for later purchase. * Easy Returns: Orders are secured under 100% Buyer Protection Rights. Download the app NOW and start experiencing ShopClues!